Lately, I’ve been doing a lot of baking, because it helps me relax- especially bread baking. 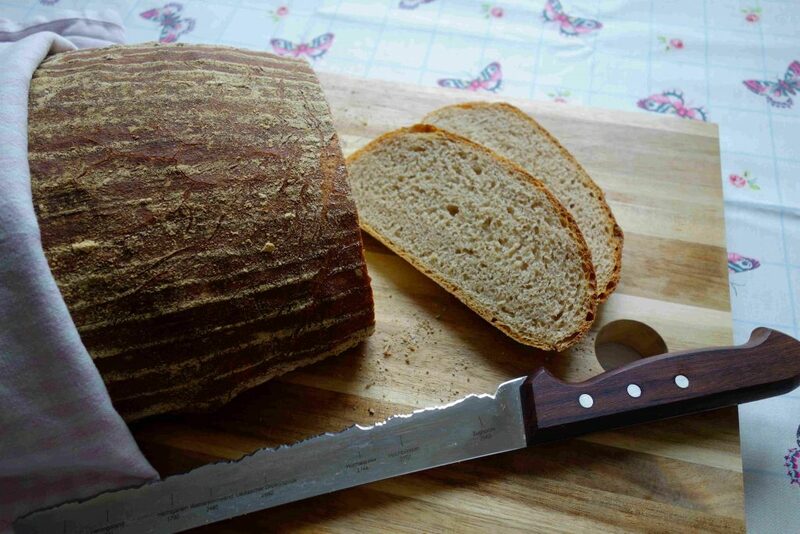 This week I made a rustic cottage loaf with spelt and emmer flour and it tastes amazing. I like emmer flour in general, because it adds some variation to our diet. The cottage loaf is done with a poolish. That way the bread gets a very elastic crumb and it doesn’t take as much time as a sourdough would take. This is definitely a plus in a generally stressful everyday life. First, you have to prepare the poolish. It has to rise for at least 6 hours at room temperature. I usually do the poolish the evening before in the bowl of my Kitchenaid and let it stand on the countertop overnight. Therefor, I just cover the bowl with a clean teatowel. The next day the dough has clearly risen and smells fruity and slightly alcoholic. Next you make the main dough. Therefor, dissolve the yeast and salt in lukewarm water. Then you pour the two flours and the yeast-water-mixture into the bowl with your poolish. Next you work everything with the dough hook until a smooth dough forms. Cover it with the teatowel and let it rise for around 40 minutes. After the dough has risen, pour it on the floured countertop and stretch and fold the dough. Then form it into a ball and put it back in the bowl. Cover with a teatowel and let it rise for another hour at room temperature. Then you take it out of the bowl again and form it into the shape you like. 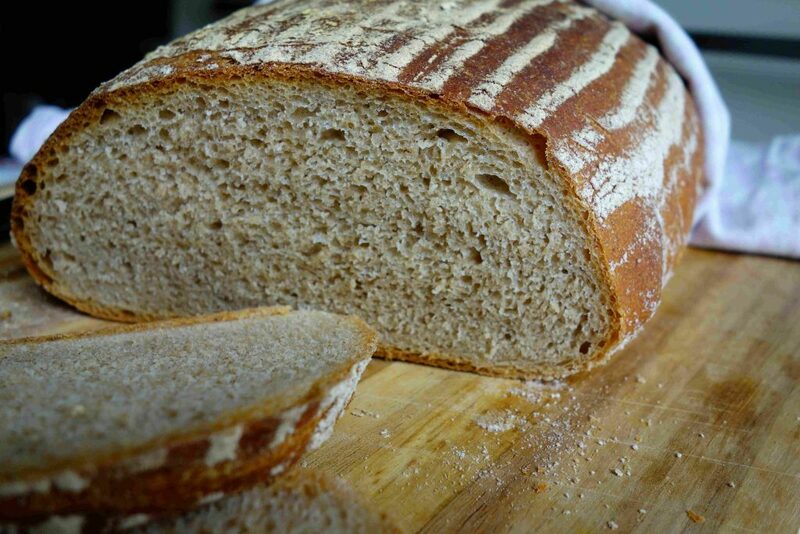 I usually do one big oval loaf, but you can also do two small oval or round loafs. Next you put your loaf in a floured fermentation basket, cover it with a teatowel and let it rest for one hour. If you don’t have a basket, you can also use a bowl lined with a teatowel. Meanwhile, you can preheat your oven, a baking tray and a bowl for steaming to 250°C. After the last proving, turn the fermentation basket upside down on the hot baking tray and pour boiling water in the bowl for steaming. Bake the bread for 10 minutes with a lot of steam. Then you reduce the temperature to 220°C and open the oven door for 30 seconds to let the steam come out. Bake the bread for another 20 to 25 minutes until golden brown. Let it cool on a rack and consume within 5 days. If it’s too much bread for you, you can just do two smaller loafs- like already mentioned above- and just freeze on of them for later.